Stuart Matheson, an aviation management consultant, offers support services to airlines, airports, and allied suppliers. Matheson received a Zintro inquiry from a client looking to create a military dashboard for marketing reasons. The client wanted a dashboard solution for war or crisis and needed an expert with experience who could describe KPIs. Matheson sent a proposal and got the contract. Do you have a Zintro success story? We would like to hear about it. Email us at admin@zintro.com. Try tapping into Zintro’s expert-base with an Inquiry. It’s free. 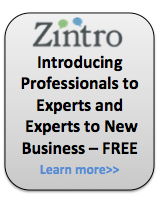 And, sign up as a Zintro expert to start generating free leads for your business. hey buddy good service. such a nice post. Obesity epidemic in the US: What to do?